Next PostChernobyl, a six card poker game, and it’s progenitor, Love Canal. Yes! By not over-heating the chocolate and just barely melting it, you’re actually achieving a kind of “cheater” temper of the chocolate. Actually tempering would ensure it doesn’t break and supposedly make it break sharp and crisp like a candy bar but the low temp melt does much of the same. Assuming you use a pound of thick cut bacon, about a dozen slices, how much chocolate should you use? Bill, if memory serves, somewhere between 2 to 1 and 3 to 1 was the ratio of bacon to chocolate. 5 to 2 would be just about right. 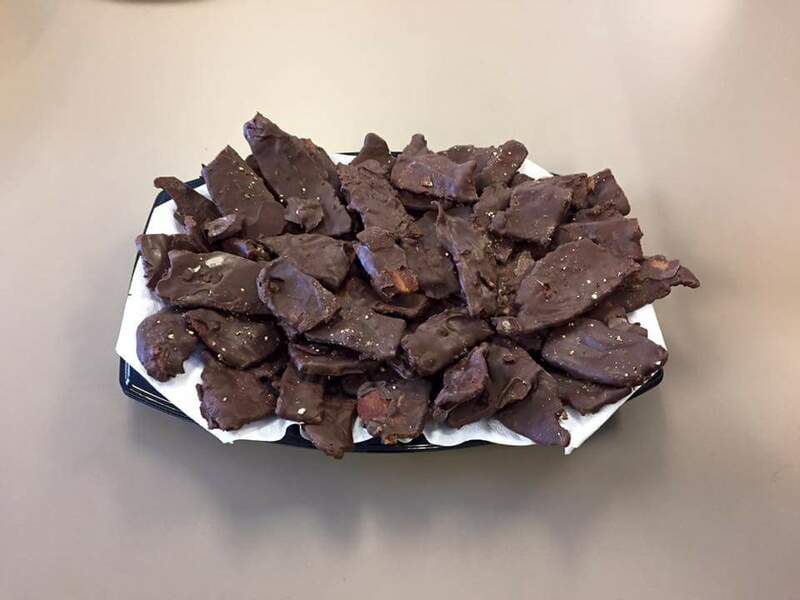 (In two of the past binges of making this, we used 9 pounds of bacon and 3 or 4 pounds of chocolate, and 5 pounds of bacon and 2 pounds chocolate, with about a half a pound of chocolate left over. Much depends on how melted the chocolate is, and how thick a coating you let stay on the bacon during the dipping process. One bit of advice – try very hard to NOT have other folks around during the making of this item. If there are, you will find that many of the pieces never make it onto the plastic wrap and into the fridge. And, as good as it is all gooey and melted, it is SOOO much better as a bacon-cored chocolate strip.